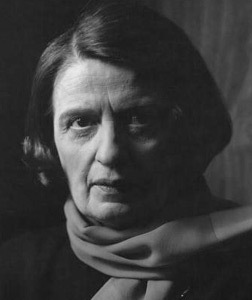 The 45th anniversary of the publication of Atlas Shrugged (Signet 1996) was announced with a new edition and an introduction (1992) by Leonard Peikoff who has wisely let Rand speak for herself in the intro, taking excerpts from her unpublished Journal. 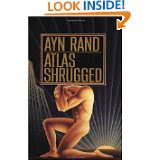 Atlas Shrugged, according to Peikoff's recollections, did not become the title until Frank O'Conner suggested it in 1956. Up until then she had titled it The Strike. 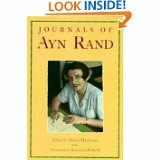 After finishing The Fountainhead and having Nietzsche's quotes scrubbed out of it, Rand probably put her obsessive reading - from age 16 to her late 30's, early 40's - of him aside, as Baudrillard did after he failed his exams on Nietzsche, and Nietzsche went underground in Rand as in Baudrillard. I don't show directly what the prime movers do - that's shown only by implication. I show what happens when they don't do it. Rand has intuitively identified Foucault's power/knowledge relation so laboriously and elegantly recorded for us in The Order of Things, The Archaeology of Knowledge, Discipline and Punish, Madness and Civilization, The History of Sexuality, and all his genealogies published and archived now, his great method taken from Nietzsche. Rand does it in one fell swoop in Atlas Shrugged. 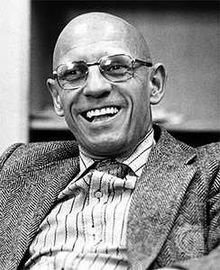 Foucault has relentlessly delineated the relation of power and knowledge. Power does not exist by itself. It cannot be given, taken, conferred, lost, held. Power is ALWAYS in relation to knowledge; the two cannot be separated. Rand has written a fiction whereby she is removing knowledge from the world. She is saying that the knowledge of the prime movers is what powers the world! Remove the prime movers and knowledge is removed from the world, but so is power! The world sinks into chaos, starvation, and death. She is saying that - understand this in relation to the Foucauldian Grid of power/knowledge - knowledge and power are relational in the world. She is saying this in her Journal in 1946, when Foucault is 20 years old, long before he studied Nietzsche and applied Nietzsche's genealogy to human behavior. And she is saying this fictionally in Atlas Shrugged published in 1957. Rand has heralded Foucault's lifetime study of the relational necessity of power/knowledge in Atlas Shrugged. Power and Knowledge are FUSED, inseparable, joined, married to each other!